Give your website an amazing UI & conversion potential with our customer centric website design that works on all devices. Transess Technologies offers the best eye catchy designs, alluring and at the same time entices the audience. The audience will hold the last impression in their mind. For such impressive website designing you are at the right place. The designs have the approach like RWD that is responsive web design allowing WebPages to be viewed in response to the size of the screen or web browser. Like it can be good for the mobile and also good enough for the tab. Flexible images are sized in relative units to give the best view to the viewers. It is very important that different business have different kind of website design requirement. Based on your business category you need to plan a website which will reflect your products or services. 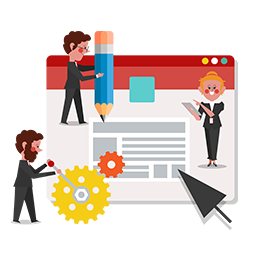 So our web designer does a thorough study of your business requirement, check your competitors and then proceed to develop your website design according to your need. We are into both Dynamic as well as Static website designing according to the need of the customers. We offer the service of customized web designing so that it please our clients and at the same time our professional designers and developers get complete web design which compliments your business strategy and profile. You just need to tell us your detailed requirement and we will send you the estimated quote within one business day. We are renowned as one of the most prominent providers of customized website design service and custom web design service. Landing page designs from Transess Technologies is according to the rules having all call to action so that your potential buyers never are lost and you can get conversion easily. Our expertise will help you to build your brand and generate a huge traffic, leads and have huge sale through your website. All this is done by our professional team of programmers who constantly work for the betterment of your website. We built designs and develop high quality web site and cost effective for diverse range of our clients. The first step we take is to understand your project well from you. Also after a proper understanding we offer suggestions on how the project should move. After the brain storm with our other senior members we will send the business proposal which will be well discussed with the designers as well as the developers head. We always move ahead after your proper knowledge and approval on the changes which we are suggesting you, so that there is no place for any confusion or misunderstanding between us.